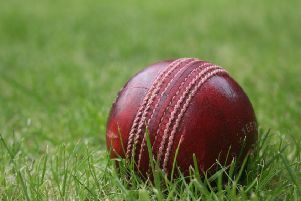 A third successive Saturday to be disrupted by rain could not prevent the promotion charge of Barkby United Second XI. Barkby thrashed Illston Abbey Seconds by 183 runs at Beeby Road to go second in Division Five East going into the final weekend. After a delay, a 27-overs-a-side contest saw Barkby batting first with Louis Botting and Jack Wood smashing 23 from the first over. The pair continued the onslaught at more than 11 runs per over until Wood was trapped LBW for a quick-fire 30 in the ninth over with the score on 95. After a monstrous six, Conor Percy was bowled for 13, bringing in Matt Harby with Botting already past a second successive 50. In the 15th over, Botting missed his ton for the second game running when he holed out to cow corner on 97. Harby and Max Carmichael didn’t take their foot off the gas, bringing up the Barkby 200 in the 19th over. Carmichael sacrificed his wicket looking to add extra runs, bowled for 22. But big hitter Harby remained unbeaten on 35 when skipper Adam Cookson declared on 227-4 from just 21 overs, gaining an extra six overs to bowl Illston out. Botting opened the bowling and in his first over a dropped catch at gully from Cookson was followed by two wickets, Matt Harby taking a skier, and the second clean bowled. James Kirk took Barkby’s third wicket in the second over thanks to a catch from the diving Percy at gully. Man-of-the-match Botting (5 for 26) then ripped through the middle order, taking three more wickets in just four balls to round off a good day with both bat and ball. His only blemish was to put down a regulation catch at fly slip. Kirk (2 for 16) clean bowled Illston’s number seven (41-7) before Dave Botting and Adam Cookson both picked up a wicket in their one-over spells, with contrasting caught and bowled attempts. A suicidal run out brought the end of the innings, Carmichael doing the honours as Illston were all out for 44 inside 14 overs. Barkby’s second 30-point win in as many weeks leaves them knowing a win at Oakham on Saturday will be enough to secure promotion.